How in the world can I bring my cellphone to Metro Manila if they're not allowed in the US Embassy? That was my first thought when I found out that electronics weren't allowed in the US Embassy during my K1 visa application interview. I was coming from Batangas and going to Manila just for that appointment. 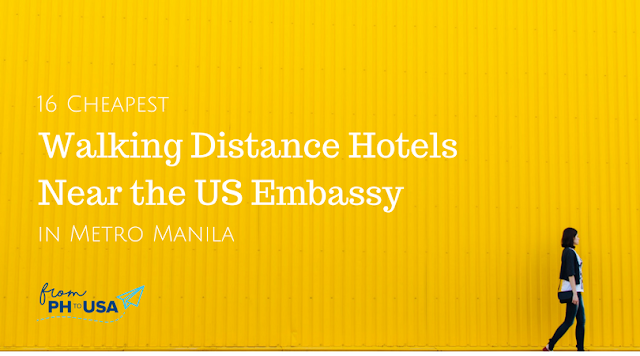 I knew that the US Embassy was along Roxas Boulevard and most hotels I see in that area were very expensive so I thought of tagging my sister along on the day of the interview, leaving her in a coffee shop with my cellphone, and going back for her when my interview's done. That would've been expensive, too, since I will pay for my sister's bus fare and food. Sure. 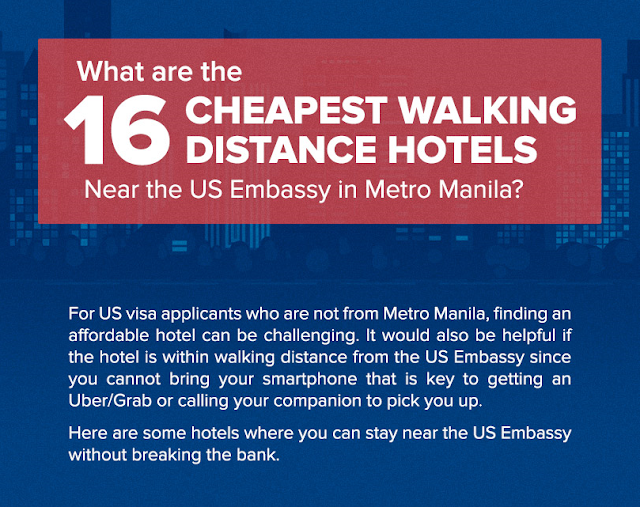 I'll walk 5 minutes further instead of just crossing the street if it will save Php5,000. Luckily, Tambayan Capsule Hostel hosted my stay just in time for my interview so I'm grateful for that. I would've still chosen them even if they didn't do that, to be honest, because they are very affordable and accessible to the US Embassy. Despite that, I found some other choices online. There were places that cost less than what I listed here but I wouldn't trust a hotel with no website or social media presence to be my accommodation for an appointment as important as this. So, here are 16 hotels including their cheapest rates for a 1-night stay for 2 people that could fit your budget. Note: Prices were determined by using Jan 29 - Jan 30 as booking dates and with Php 49.80 = USD 1 as the exchange rate as of 1/3/2018. Walking distance of each hotel was determined using Google Maps. Anyone can generate a list of hotels. There are two in your list that I will NEVER set foot in again. What's more important are people's feedback regarding the hotels, both here and in the major travel sites, e.g. Travelocity, Priceline, Trip Advisor. Cherry Blossoms: Bedbug City -- If you want to be on the menu, this is your hotel! You're right. Anyone can make a list but not everyone does it.